Who is in charge of our Easter Monday game? GRAHAM HORWOOD from Bedfordshire is the man in charge of our Easter Monday game at The Valley. Graham began refereeing at the tender age of fifteen and reached the National List of Assistant Referees in 2001 after progressing through the South Midlands and Isthmian Leagues. In 2005 he was promoted to the list of Panel Referees and, two years later, to the National List of Referees. After a two year absence Graham returned to the Football List in the 2014/15 season. Graham was last in charge of a Millers game in the Championship at the Goldsands Stadium in September 2014. Steve Cook scored the first goal of the game on the hour mark for Bournemouth but a last minute goal from Jordan Bowery gave the Millers a point from the game. Joe Skarz and Richie Smallwood saw yellow that day for Rotherham with the Cherries having Ryan Fraser booked. Graham was in the middle for a Millers game in February 2011 when Rotherham travelled to the Pirelli Stadium to take on Burton in a League Two game. Greg Pearson put the hosts one-up in the opening two minutes but John Mullins equalised four minutes later. Just after the half hour mark Aaron Webster scored to regain the lead for the Brewers but goals in the second half from Marcus Marshall, Adam Le Fondre and Jason Taylor gave the Millers a four-two win. Two players from each side were booked on the afternoon – John Mullins and Marcus Marshall for the Millers and Burton’s Nathan Stanton and Russell Penn. Graham was in charge of our game in December 2008 at the New Meadow against Shrewsbury where the Millers ended the game with nine players on the pitch and lost one-nil. On fifty-nine minutes, Drewe Broughton was given a second yellow card to leave the Millers one short ten minutes from time, goalkeeper, David Stockdale, saw red after clipping the heels of Kevin McIntyre in the area. Steven Cann came on in Stockdale’s place but was sent the wrong way by Grant Holt from the penalty spot for the only goal of the game. Graham was in the middle for our game at Don Valley against Cheltenham in April 2010 which ended nil-nil. That day he kept his red cards in his pocket but booked Pablo Mills and Gavin Gunning. The first time Graham was in charge of the Millers was in September 2007 away at Barnet. The Bees won the game two-nil with goals in the second half from Adam Birchall and Jason Puncheon who scored from the penalty spot. This season Graham has been in the middle for twenty-seven games showing just five yellow cards. His last game was a friendly International between Hungary and Scotland which the Scots won one-nil. 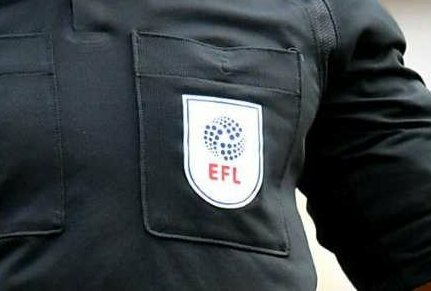 Running the line on Monday will be Callum Walchester from Suffolk and Paul Kelly from Kent,while Gregory Read from Surrey will be the Fourth Official.